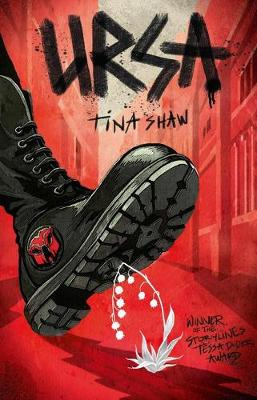 Ursa is the latest book out by New Zealand author Tina Shaw. 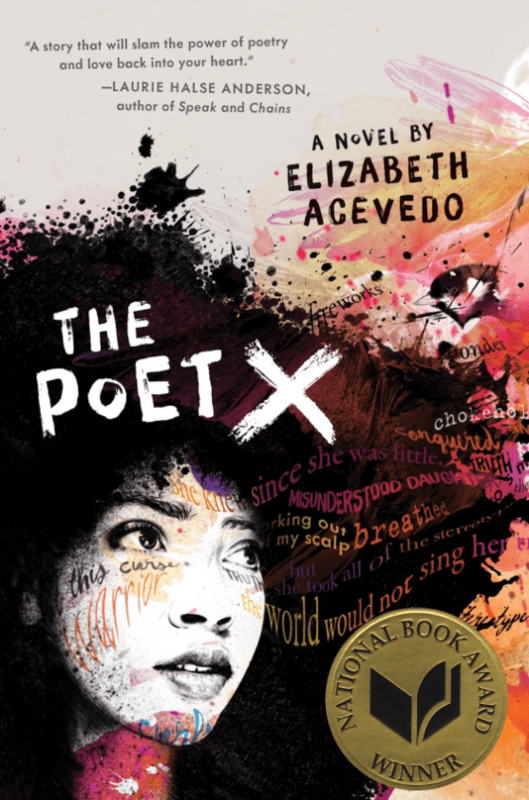 It is a Young adult book set in a disturbing time of tension and oppression. The city of Ursa is inhabited by two races of people. The Cerels and the Travesters; the have and the have-nots, the oppressed and the oppressors. The Travesters have everything, they live in good housing, have food and clothes while the Cerels live in abject poverty, unhealthy, overcrowded housing. Leho is fifteen and lives with his blind mother, grandmother, sisters and brother crammed in a tiny space accessed through a manhole. They are almost always hungry. His father has been taken away, deemed a threat to society. Men keep disappearing. Rules are everywhere. The Cerels are said to be inferior so are not allowed to breed. No more babies. The end of their race is inevitable. It is a hostile world and dangerous. Leho has had enough. He wants changes, he wants freedom for his family and friends. He is prepared to risk everything. Ursa is very much an allegory for what happened in World War Two inside Nazi Germany and the more I read, the more familiar the story became and the more sick I felt that this kind of hatred was actually once real. I connected with Leho and his family. They are strong characters in a world they did not choose but must do everything they can to survive. The repercussions for trying to make changes can be fatal but Leho is determined. Revolution is in the air. Shaw gives us believable characters, in a bleak and desperate setting. Day-to-day life is hard but Leho’s, older brother Jorzy entertains the family at night with stories. These stories weave themselves into the novel, story within a story, offering further understanding to the plight of these people. Jorzy too, wants change but he is more patient than Leho, plans more but Leho can’t wait. The tension between the brothers builds as does the overall suspense. One wrong move and it could all end in disaster. It is certainly a book that will leave you thinking. Can this happen again? How can we make changes for a better world. This is a solid read which keeps you going, and keeps you thinking. A well-deserved winner of the Storylines Tessa Duder Award. 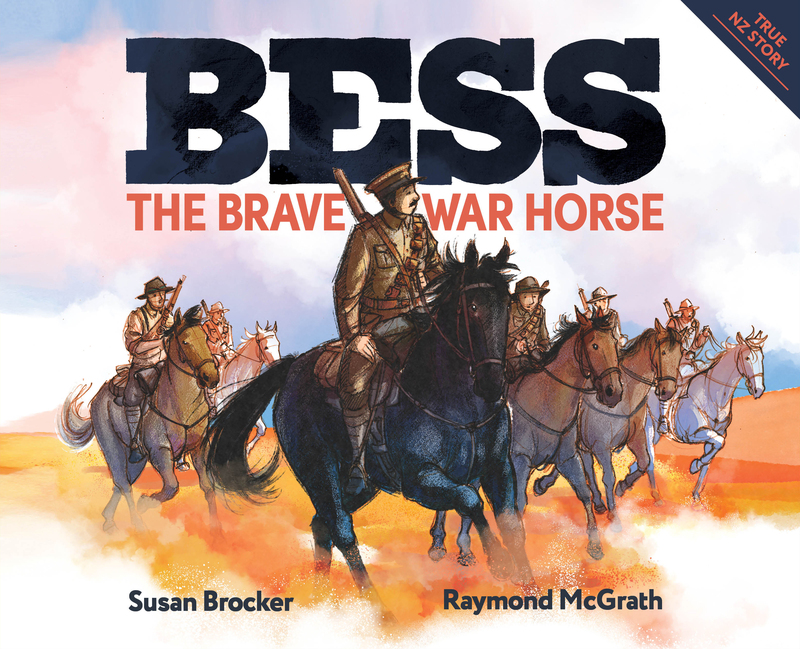 Bess is a fine filly of a horse frolicking in grassy fields in New Zealand when she is chosen by Captain Guy Powles to be his horse. He said she was a beautiful horse and strong enough to carry him through battle. We follow Bess’s journey as she spends weeks at sea, cramped and sweaty below deck in a ship heading for Egypt. Bess and the other horses were often frightened , especially when the seas were stormy. When they finally arrived in Egypt life became busy with preparations and training to help the soldiers on the battlefield. Bess and her master had a wonderful relationship where they cared for each other and more importantly, trusted each other. The book provides us with a different perspective of World War One. The language is descritptive and features some wonderful alliteration. This is a beautifully illustrated picture book for older readers. I love the end pages with their two-toned illustrations of Bess; first as a young horse and then back home in New Zealand, fully grown and happy. The end pages alone would look good framed on any wall. The colours throughout mirror the dusty fields and dark uniforms worn by the soldiers. The research by both author and illustrator is obvious and makes this book an important one to have in your school libraries. The sad fact is that out of 10,000 horses that went to war, only four came back to New Zealand. Bess was one of them. Her story is true. The first thing you notice in this re-release of Chinatown Girl is its fresh new cover. It is bright, eye-catching and appeals to the preteen and early teen reader. Twelve year Silvey Chan begins her diary on January 1st 1942. The World is at war and life throws many complications at Silvey and her family, friends and the Chinese community she belongs to. 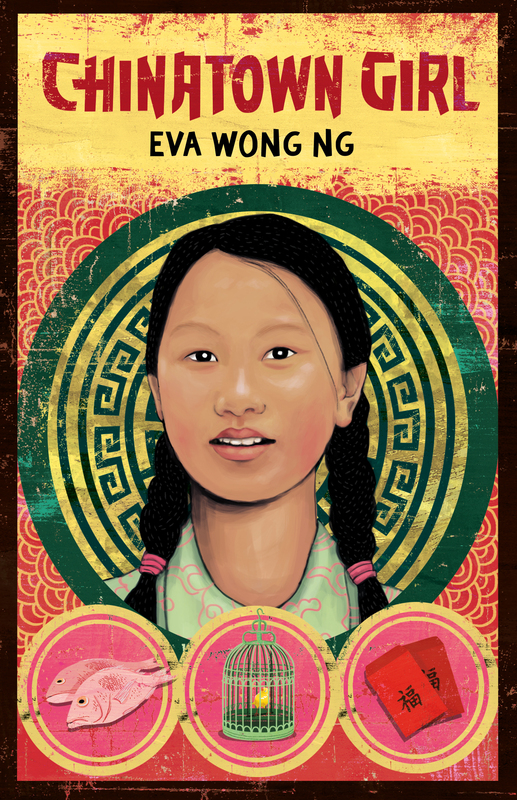 Like other books in the My New Zealand Story series, which focus on certain events in New Zealand’s history, Chinatown Girl provides insight into the Chinese community in downtown Auckland. Through Silvey’s diary entries we find out what it is like to be different from others, including racism with Government poll taxes for Chinese people. We read about many Chinese traditions and the constant fear as the war continues overseas, but seems to get closer and closer. At school they children practice air-raid drills just in case. We also read about rationing and the consequences of a world at war. There is much excitement in town when the American soldiers arrive and new friendships are made. Silvey is likeable and inquisitive and her diary makes a good and informative read about life in 1942 New Zealand. Silvey is determined to make something of her life and I bet she does. You can find teacher notes here if you want to take this beyond a simple read. Blackbird by N. D. Gomes. Top murder-mystery for young adult readers. One of those books you just can’t put down. I have just listened to the audio edition of this new Young Adult novel by N. D. Gomes. I generally listen to books while driving to and from work. With Blackbird I found myself making excuses to go out driving just so I could hear the rest of the story. There was certainly a few extra trips to the supermarket. Olivia disappeared the night the blackbird died. 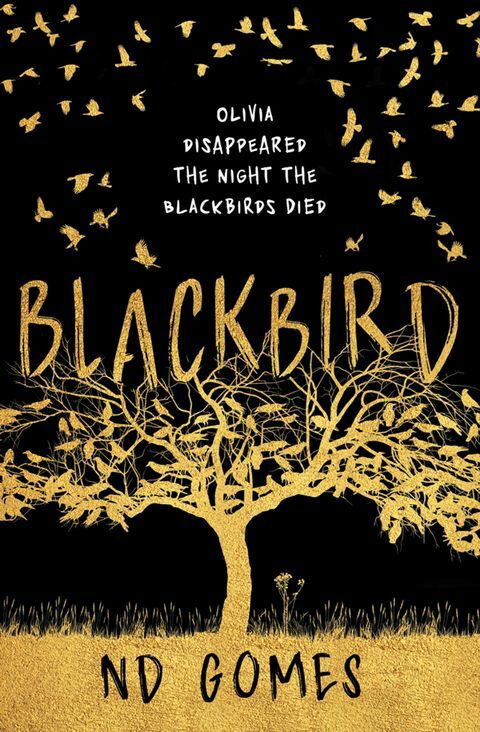 It was New Years Eve the night that dead blackbirds descended, hours before fourteen year old Alex McCarthy’s sister Olivia went missing from a party. Committed to finding out what happened to her sister, within the previously safe walls of their subarctic Orkney village, Alex knows that dishevelled, sometimes intoxicated Detective Inspector Birkens is her best shot. This story jumps right in at the beginning and before you know it you are totally involved with Alex and her family. As things progress, sadly, the story becomes a murder mystery. I love Alex and her sense of the world around her. Her pain and grief is raw and so real. She is so determined to find out what happened that she unwittingly puts herself in danger. We see a family grieving, each in their own way and this only makes it all so much more believable. The landscape too has its own place in the novel where island living has its own set of rules and where everyone knows each other. I believe she will be just fine. 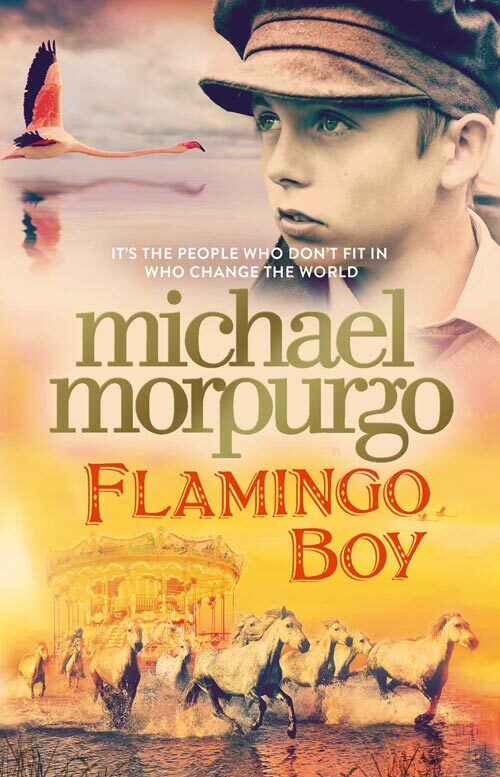 I love the relationship Alex has with Detective Inspector Birkens, a rather flawed but real character, who is equally determined to find out what happened. And as with all good novels, there are secrets to be discovered. I kind of see Alex as one of those characters that I will stop and think about from time to time and hope that she is doing okay. I believe she will be just fine. A top murder mystery for young adults. Shortlisted for the junior fiction awards in the 2018 New Zealand Book Awards for Children and Young Adults. 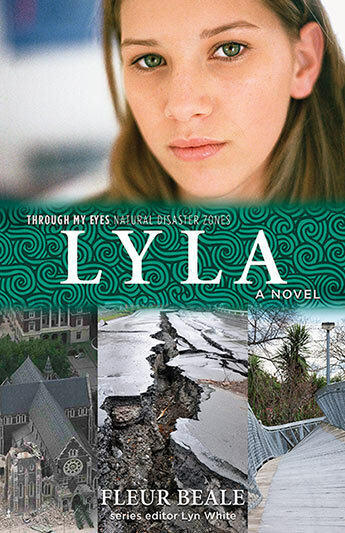 On the 22nd of February 2011 thirteen year old Lyla is in the centre of town when an earthquake devastates the city of Christchurch. In town because of a teacher union meeting where secondary schools are closed, Lyla and her friends are faced with absolute terror as a massive earthquake thunders beneath their feet. The ground shakes so violently that buildings all around them tumble and fall with the frenzied force of the shaking. They separate in an effort to go home but Lyla gets caught up helping injured people and this is where we see how strong Lyla is as a character. The novel focuses on the next few months and the impact of the continued aftershocks, damaged houses and day-to-day life living in a munted city. It was a terrible time for the people of Christchurch and Canterbury and Fleur Beale has captured many of the issues people had to deal with or learn to overcome. Lyla is mature beyond her years and it is her family, friends and neighbours that become more important than things. 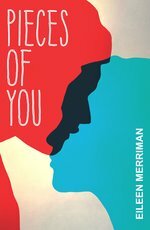 Supporting each other, even the unlikable bully Matt is what matters most and it is these relationships which are the strength of the novel. Lyla remains calm in the face of it all but eventually, she needs to confront the reality of everything she has been through and everything she has witnessed. Having lived through every one of these earthquakes myself, this novel brought back a lot of memories and not all of them pleasant ones. A reminder that disasters often bring us closer together. Rebecca McQuilten is 15 and has just moved to a new city where she is the newcomer in a school where everyone knows each other already. Wanting to fit in she accepts party invitations and goes places when asked. It is at one of these parties that something happens, something she keeps to herself and struggles to deal with. Her way of coping creates a whole new set of problems. Becs meets Cory, the boy next door, and soon finds herself in an on-again off-again sort of relationship. He is just the person she needs to help her build up her confidence and believe in herself but he has demons of his own. It is good to read a book about real issues, real relationships and struggles that teens do deal with everyday. The characters are flawed but real. Their problems and insecurities remind us of what it is to be a teenager again. The writing is just the right pace. No rushing or skipping over things but takes issues without glorifying them or making them more than they are. At the heart of the novel, for me, is the relationships and learning to read other people and understand that everyone has demons and we all need support at sometime in our lives. This book does deal with issues of self-harm but it is handled well and certainly not the focus of the novel. Relationships are the real focus and that is a good reminder to us all; that people matter. Currently short-listed for the Best First Book Awards in the New Zealand Book Awards for Children and Young Adults. Find out more here. If you have ever wanted to know anything about earthquakes in New Zealand, then this new book from award-winning author Maria Gill has it all. The production is a perfect example of what a quality non-fiction book should be. It has all the features we expect with contents pages, glossary, bibliography, credits, headings and subheadings, photographs, graphs, symbols and timelines all sandwiched between a shiny, colourful, glossy cover. Maria Gill is well-known for her dedication and determination to research her subjects to provide readers with the best and most accurate information. Maria Gill explains what earthquakes are, why they happen and the damage they can cause. The timeline goes way back in time to some of the first earthquakes and marks many of the strongest ones that occurred. She also explains what to do in an earthquake and how to keep yourself safe which is something everyone in New Zealand needs to know. Having lived through the tragic Canterbury and Christchurch earthquakes, this book brought back many memories but it is good to see everything explained and know that while we cannot predict or stop earthquakes; we can be prepared and that is most important. The language is easy and informative without being too formal or wordy, making it a suitable choice for everyone. The book is informative and shares links to videos on the internet for further research or explanation. There is also a friendly helper throughout the pages. Maria introduces us to Rūaumoko the Maori god of earthquakes and volcanoes who helps explain things as readers move from page to page. A lovely addition to this quality book. 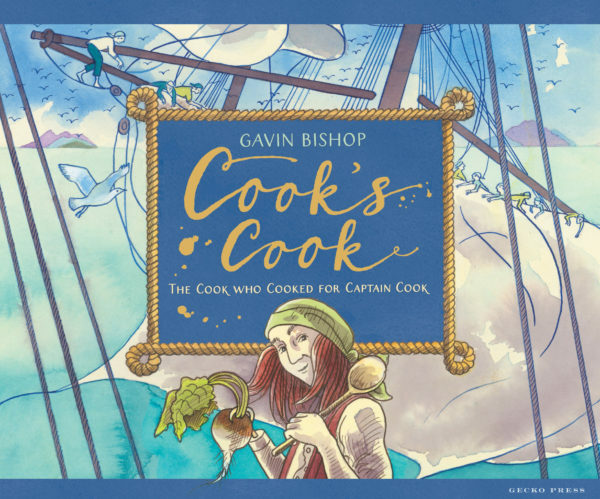 Primary schools through to secondary schools will certainly benefit from having this book in their school libraries. Those who follow this blog probably know how much I love verse novels. I love everything about them, especailly the language and how it can pack a punch. Long way down knocked me sideways. William Holloman’s brother has just been murdered. He wishes he had laughed more at his brother’s dumb jokes because he won’t ever get the chance again. His brother is dead. Tragedy seeps through every page of this book. The language is real and gritty. It is powerful, beautiful and haunting. After his brother’s death Will knows one thing for sure. He must follow the rules. It is raw and dark and I will think about Will for a long, long time. 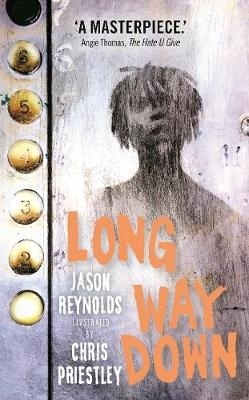 After reading this book I had to just sit awhile and reflect on the lives of the characters. The reality is that there are many William Hollomans in this world and we need to change this. How? I don’t know the answer but something has to change for people like William. They get caught up in the world of poverty, gangs, hardship and anger. This book takes us in to Will’s world, and his thoughts. It is a dark and scary world and as tough as he is trying to be, we see his vulnerability. We hear his thoughts and we find ourselves caring for him in a way only good writing can make us. An amazing insight into the sad and desparate life of a young man looking for revenge. Loved it so much. Need to read again. Listen to the first few pages being read by the author. Based on author Des Hunt’s own uncles who went to war, this novel is a chilling account of what went on in the trenches during World War One. It is at times harrowing and confronting but there is also humour, just as in any difficult situation, which makes it so real. Four Christmases have passed since the world went to war in 1914. Struggling to survive in the trenches, close to enemy lines, amid the terror of gunfire and the whine of warplanes, Kiwi soldier Henry Hunt rescues a shaken little dog. He has no idea he’ll soon be facing a disciplinary hearing. To Henry’s relief, the Major allows the little foxie to live this time. Henry finds the dog is not only a comfort to his fellow soldiers on the battlefields of France, but a great ratter, too. Together, can they survive the Great War? Henry Hunt is both believable and likeable. He has panic attacks from a childhood trauma which still haunts him but he soon finds himself having to face these fears head on. They seem insurmountable but will put himself and others in danger if he doesn’t overcome them. Hunt’s ability to put the reader in the character’s footsteps is brilliant. We too, feel the same fear as Henry. The author doesn’t hide us from the reality of life in the trenches either. I flinched many times when reading about the rats which seemed to be everywhere. The descriptions of trench foot were also very real. Amputation would come next. Horrible stuff but sadly, horribly true. Henry faces bullying by Sergeant Bell who continually and unjustly calls him a coward. There is injuries, danger, death all around but there is also loyalty and comrades to help him get through the awful times. The rescuing of the wee dog they named Poppy is a wonderful part of the story. I fell in love with Poppy and at times found myself holding my breath when she got in to danger. The courage of these soldiers is amazing. The months and years in the trenches must have been horrific. Many of the soldiers would be wounded, patched up, and sent back for more which really is beyond our comprehension. Des Hunt’s account of Henry Hunt takes us there as much as it is possible, so that we can see and feel what it might have been like during World War One. A compelling read and superbly done. A great story to end the series Kiwis at War. Great read for some Year six students (but not all) but certainly Intermediate through Secondary levels. Teacher Notes will help make the most of this novel. 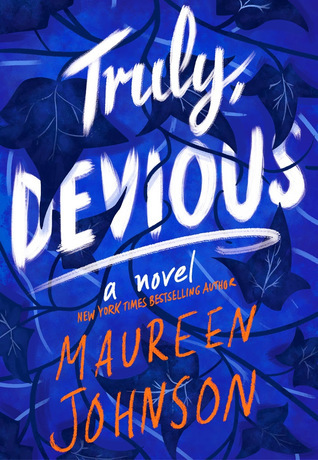 I never think twice about picking up a novel by Maureen Johnson. Loved her Shades of London books and having just read this first book in her new series, I am already waiting for book two. A thoroughly good murder-mystery for young adults. Not long after the school’s opening, Albert Ellingham’s wife and daughter were kidnapped and the only clue was a note signed by someone called Truly Devious. His wife’s body was found, but the daughter was never seen again. It has remained an unsolved mystery for many decades but now Stevie Bell is attending the school and her plan is to solve the mystery. However, there is something sinister happening and Stevie and her new friends find themselves in trouble when the past and present seem to collide with more murderous adventure. And there is always the issue of whom to trust! Well written, good pace and a very cool setting. Stevie is a like-able, believable character and a very keen detective-in-the-making. Her determination to work through research and the new puzzles makes this another good read from Maureen Johnson. My dilemma is that I now have to wait until next year to read what happens next. Grrrrr! 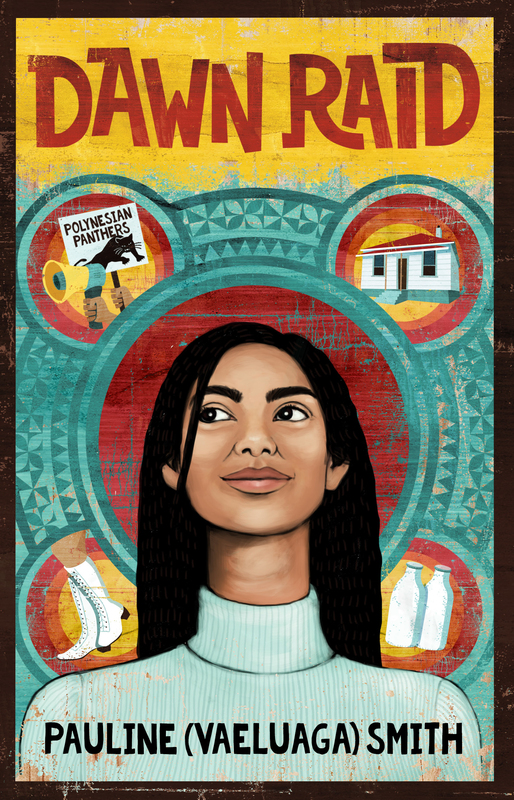 Dawn Raid : My New Zealand Story by Pauline (Vaeluaga) Smith : 1970’s protests, overstayers and injustices against Pacific Islanders. Like many 13-year-old girls, Sofia’s main worries are how she can earn enough pocket money to buy some groovy go-go boots that are all the rage, and if she will die of embarrassment giving a speech she has to do for school. It comes as a surprise to Sofia and her family when her big brother, Lenny, talks about protests, overstayers and injustices against Pacific Islanders. The beauty of the My New Zealand Story series is that we witness some of New Zealand’s important historical moments through the eyes of children. Much is documented from historical times, but it is in general from adults, journalists, and news media. This series takes us behind the scenes, as children tell us in diary entries, what they saw, felt and experienced. Sofia begins her diary on June 1976 and initially she comes across as a little naive, although to be fair, it was a different time to the experience of 13 year olds of today. What makes this book special is that as the story of the dawn raids unfolds, we begin to see a growing maturity in Sofia. A key feature of any good book, is the growth of a character. Sofia records daily events with honesty and her family life soon becomes familiar to us. Her family is close and extended family are equally important. Slowly, news filters in of the many dawn raids where police storm houses in the middle of the night and arrest overstayers; people from other countries who have stayed longer than their working permits allow. In particular the raids were aimed at Pacific Island nationalities. Through Lenny and his contacts we learn of the reasons for the raids and the underlying theme of racism and human rights. We also learn about the group called the Polynesian Panthers and how they stood up to people in power. This is a great book to read as a class and to study themes of racism and media reporting and media bias. One of the biggest issues we face today is that of “fake news” and this would be a perfect book to explore the notion that not everything we see or hear is as it really is. I thoroughly enjoyed Sofia’s story. Loved the many references to the 1970’s music, fashion and television culture. Wow. Now this is what I call a cover. It is dark, broody and mysterious and grabs your attention straight away. 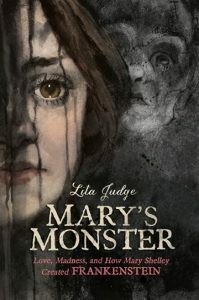 Mary’s Monster is a biography of Mary Shelley written in verse form. I have been a huge fan of verse novels for many years so this already has me keen. So keen in fact I have already pre-ordered it from my local library, although as it isn’t published until later this month I may have to wait a bit. However, from all I have seen I know this is one I will also be buying when it comes out. Take a look at the illustrations on her site and on the trailer below. Over 300 pages of verse and illustrations. A tortured soul and her monster, drawn in haunting, Gothic illustrations, this book has got to be at the top of my most eagerly awaited reads for the year. Each illustration is a work of art on its own and would be fantastic to hang on any wall. I am so excited for this book. Simply cannot wait. Really, just can’t wait. Beautiful. You can read some of the story on her website and while there do check out the gallery as there are some superb and beautiful illustrations from her picture books.